Going into the New York Primary today, let’s look at the numbers. They point to big wins by Donald Trump and Hillary Clinton, though Bernie Sanders has been closing the gap in recent days. Other numbers are changing, and we’ll cover those, too. Real Clear Politics watches all the polls. It shows Trump with an average lead of 30.3%. More importantly, Trump is expected to take 55% of the vote. That’s important, because New York’s primary rules would give him an automatic 14 delegate bonus, according to RedState. [The] state’s 95 delegates will be awarded proportionally, rather than on a winner-take-all basis. Beyond that, 81 of those delegates are distributed on the basis of results in the state’s 27 congressional districts. Meanwhile, Hillary is 11 points ahead of Bernie, also according to Real Clear Politics. Of course, on March 30, Hillary was ahead 63% to 30.3%. The drop occurred in the four days between March 30 and April 3. The numbers have been steady since. As we’ve noted elsewhere, gamblers study their own data, and put their money down. The theory is that their judgment may be even more on target than the pundits, since they have something to lose. Their viewpoint is clearly displayed in the odds of something happening. In this case, Election Betting Odds give Donald Trump an unprecedented 100% chance to win New York. Hillary Clinton is given an 89% chance of winning. Meanwhile, the site gives Hillary an 89.7% chance to win the nomination. Trump has a 60.4% chance of winning the nomination. He had been as high as 83% last month, and as low as 44.6%–less than 50-50 chance—just nine days ago. It’s telling that the site also gives odds for a GOP brokered convention. Currently, the odds are only 51.8%. That number has been running at 66% or above recently, with all the talk about maneuvering to take delegates away from the winner. The public seems confused about the prospect of a brokered or “open” convention, as evidenced in the this new NBC/WSJ poll. Here’s the info-graphic with the breakdown, analysis follows. Republicans were asked how they feel about the prospect of a contested convention. What if Trump doesn’t get the 1237 delegates he’d need for a first ballot win? 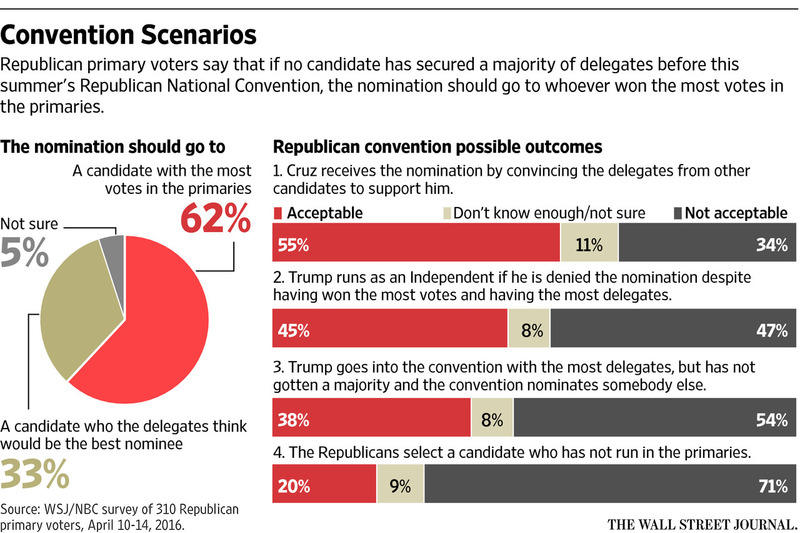 Get this—55% say it would be OK if Cruz wins at the convention. But 54% of the very same Republicans, in the very same poll, say it would be “unacceptable” for Cruz to get the nomination if Trump has the most delegates going into the convention. A full 62% say the nomination should go to the candidate with the most votes in the primaries. And 71% said it would be “unacceptable” for someone to get the nomination who didn’t run in the primaries. In fact, 45% of Republican voters say it would be “acceptable” for Trump to run as an independent if he doesn’t win the nomination. On the Dem side, there are clouds on the horizon. Another NBC/WSJ poll says that 30% of Bernie supporters will not vote for Hillary if Bernie loses the nomination. The number is 15% of Hillary supporters. That may just be a sign of the heat of the moment, and without knowing who the Republican nominee is, but it still shows that some fence-mending will be required. Previous articleCan Bernie Pull Off Another Michigan?